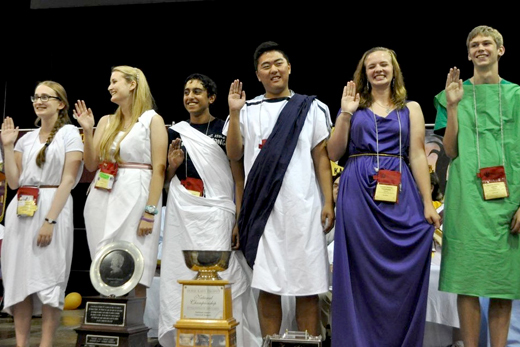 Togas come back in style as middle and high school students from around the country gather for the annual NJCL convention. Photo courtesy NJCL. Don't be surprised to find the Roman legion camped out on McDonough Field next week, toga-clad students parading down the sidewalk amid chants and cheers, or random Olympians sprinting across the Emory Quadrangle. No, they're not filming a sequel to "Spartacus." Instead, the Classics — and those who love them — are coming to Emory in full force as the University plays host to the National Junior Classical League's (NJCL) 61st Annual National Convention, an event that unites fans of Latin and Greek language, history and culture from across the nation in one of the summer's biggest on-campus events. More than 1,800 middle and high school students and Latin teachers will be on campus for the convention, which runs July 28 through Aug. 2. The week is filled with colloquia, workshops, academics and athletic competitions, plus a dense array of activities, ranging from a Roman murder mystery and the World Series of Certamen (think Quiz Bowl) to old-fashioned oratory contests and a "Day in Old Rome" where togas are simply de rigueur. With a theme of "ominum enim rerum principia parva sunt" — literally, "for the beginnings of all things are small" — the national league, which is devoted to nurturing an appreciation of the language, literature and culture of ancient Greece and Rome, identifies itself as the world's largest Classical organization, with some 50,000 members in the U.S.
"We're actually seeing a resurgence of interest in Latin," says NJCL spokesman Jeremy Walker. "Right now, about 150,000 people take the National Latin Exam every year. You can also see the numbers up on students who take the AP Latin exam." "I think the student interest has always been there," he adds. "Administrators and communities are finding it's a great way to ground their students, increase test scores, and improve overall communication skills and clarity of thinking. And we're also seeing interest up among a lot of charter schools — it's a popular way to set themselves apart." Bringing the event to Emory is a natural fit, says Walker, given the strengths of Emory College's Department of Classics and the rich Greek and Roman collections within the Michael C. Carlos Museum — which has proven an especially strong drawing card this year. "There's a lot of excitement around the Carlos Museum — it's really one of the perks of coming to Emory," Walker says. "We know Latin teachers who can't drive to Florida without somehow managing to schedule a stop (at the Carlos Museum)," he adds. "It's one of the best classical collections on a college campus, and perhaps in the U.S."
Study of the language has an especially strong foothold in Georgia, says Liz Bouis, who taught Latin for 30 years in Cobb County and is helping coordinate the national convention. In fact, Bouis reports that the popularity of Latin language study in Georgia has now surpassed German language instruction among K-12 classrooms, according to data from the Georgia State Department of Education. What accounts for the interest? "Honestly, I think Latin teachers are really good at selling their programs," Bouis says. "They've always had to fight for their programs and have gotten good at doing fun things that appeal to kids — like the kinds of events you'll see at the NJCL conventions." And that's important in helping keep the Classics alive, says Walker, "for the same reason that none of us would dream of throwing out our baby pictures or our family histories — you have to know who and what you come from to truly understand yourself, to grow and move forward as individuals and a community." "So much of our culture is rooted in the Classical world: what our founding fathers set up; our architecture, our laws, our literature," he says. "If you don't know the Classics, you kind of go through life with a veil over your eyes. Once that curtain of antiquity has been pulled aside, you get so much more." Glance through the NJCL convention program and one thing is clear: This is not your mother's Latin club. With colloquia sessions featuring Emory Classics professors speaking on topics such as "Weird, Funny and Outrageous Pompeii," "The Boy Who Lived: the Ancient Greek Roots of the Harry Potter Myth" and "Ancient Greek and Roman Drinking Parties," plus specialized Carlos Museum tours, the NJCL is dedicated to putting the ludus (that's Latin for "fun and games") back in learning. "It's a wonderful opportunity to share the Greek and Roman art in the (Carlos) collections, but also a chance for these students and teachers to spend time with Jasper Gaunt (curator of Greek and Roman art) and our wonderful docents — several are former Latin teachers — who know these collections so well," says Elizabeth Hornor, director of education at the Carlos Museum. Convention guests will have the chance to translate Latin inscriptions found on ancient cinerary urns; take a "Percy Jackson-inspired" tour led by Vicky Schecter, the award-winning author of Young Adult books set in the ancient world; explore life in a Roman villa; and get up-close-and-personal with the past, holding fragments of Greek vases and Greco-Roman gemstones, Hornor adds. Visitors can also examine Anteiquae Urbis Imago (Image of the Ancient City), jointly owned by the Carlos and MARBL, as well as the Digital Humanities project "Reconstructing Ancient Rome in the Renaissance," developed by Eric Varner and his students around the map, with Katie Cupello, PhD candidate in Art History. Timber Hines (second from left), director of Emory’s Student Activity and Academic Center, has fond memories of attending the NJCL convention at Emory back in 1991 — this photo taken in front of the DUC remains in her scrapbook from the week. The upcoming NJCL convention marks the first time the event has been held at Emory University in 23 years, and its return is especially poignant for Sherry Ebrahimi, director of University conferences at Emory. In fact, her first visit to the Emory campus was as a high school junior, when she came here to attend a NJCL national convention in 1991. And though an illness forced Ebrahimi to leave early that year, the visit made a definite impression — she would return to Emory as a college freshman. So in addition to convention activities, NJCL students will find a preview of campus life. "These are extremely talented students, and it's no secret that when they're invited to a campus, that's where they may want to apply," Ebrahimi says. "So the Admissions Office will be offering tours and a presentation on how to navigate the college search process." Those who work on campus will definitely see signs of convention events throughout the week and are encouraged to pick up a schedule and observe some of the public activities. That's already the plan for Timber Hines, director of Emory's Student Activity and Academic Center (SAAC), who has fond memories of attending the NJCL National Convention at Emory as a high school student in 1991. "It was a great experience," says Hines. "I'm from Griffin, Georgia, south of Atlanta, and we had a very strong Latin club — it was honestly the club to be in, as weird as that may sound." She credits the club's popularity to her former high school Latin teacher, Richard "Doc" Beaton, "who really let us be creative and inspired students to reach their potential." Not only was the convention memorable that year, "it was my first taste of campus life and a wonderful introduction to college," Hines recalls. In fact, Hines still has snapshots of herself standing in front of the Dobbs University Center with friends, wearing homemade togas (a sash was salvaged from her mother's curtains) and paper hats from The Varsity hamburger stand (to represent Georgia) with laurel leaves drawn on the sides. When today's toga-clad students parade down the Emory sidewalk, you'll find Hines standing nearby, cheering them on.